The spandrel is the space under a stairwell which is often unused. 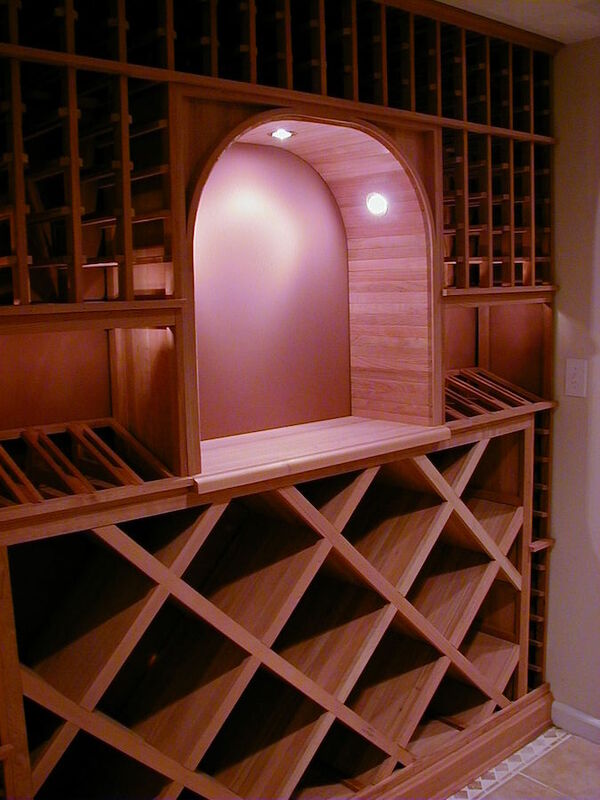 Homeowners often consider converting such unused space for wine storage. 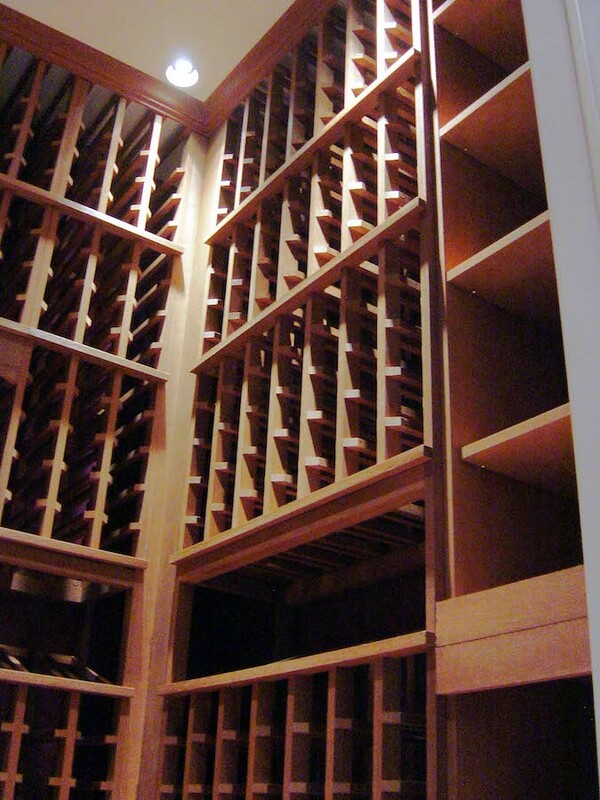 Unfortunately, more often than not, for a climate-controlled wine storage environment the economics of a project like that is unfavorable compared with an alternative like a free-standing wine refrigerator. 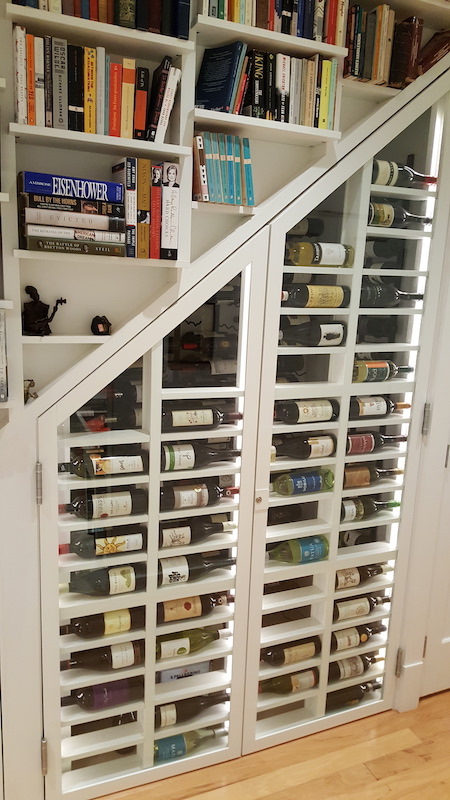 That’s because the amount of wine bottles that can be stored in a converted spandrel is about the same as a wine refrigerator, whereas the conversion construction budget is going to be significantly higher than the price of a wine refrigerator. However, if the objective is to aesthetically enhance an area, a spandrel conversion can add an eye-popping look to a room. 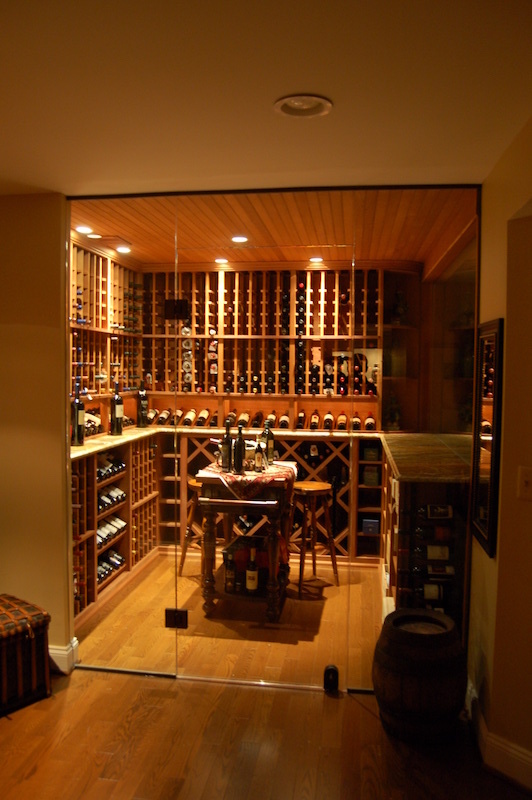 climate control is not an objective, With this projection in the Georgetown area of Washington DC, the spandrel was converted to wine storage, and custom book shelves were filled in above the glass which brightly displays the wine storage. Lighting was integrated with the door glass to enable the space to stand out. This was an amazing project. 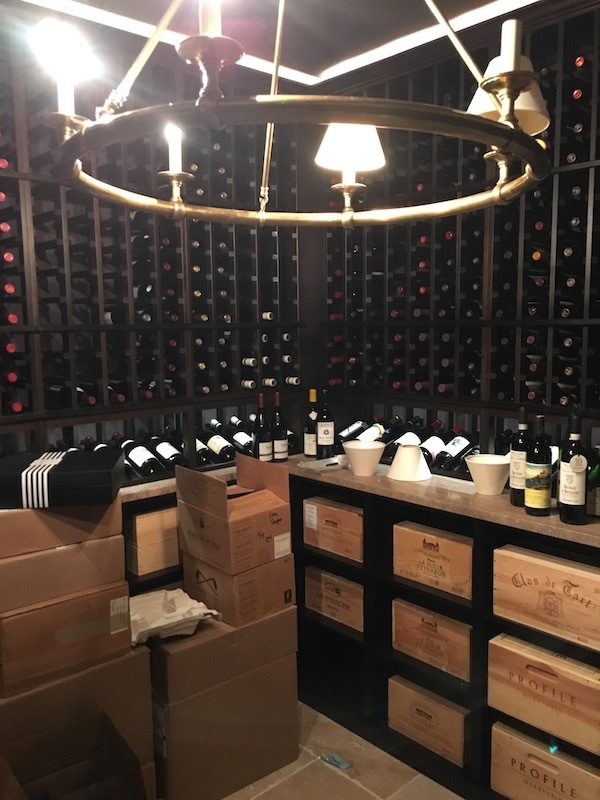 About 2 years after completing this client’s first wine cellar, the client purchased another home and moved necessitating a 2nd wine cellar project. In the 2nd project, the wine cellar was converted from a 12 ft x 18 ft space that the previous owner had made a walk in safe, complete with a Bank Vault door. Because of the cool look, we retained the door can designed a storage space that begins with an antechamber upon walking through the Vault door. One then passes through an Arch to get into the main storage area. Nicely hidden away behind the lateral displaces is the mechanical room where the cooling system sits. The room featured cherry for the racking material, and granite counter throughout. We completely loved this project. Our client, located in McLean VA, had a small unused space adjacent to an entertainment room. Lots of glass was used to both enhance the visibility of the wine cellar, as well as to make the wine cellar seem to be larger than it would otherwise appear. This 8 feet x 8 feet area provides almost 1,000 bottles of storage. 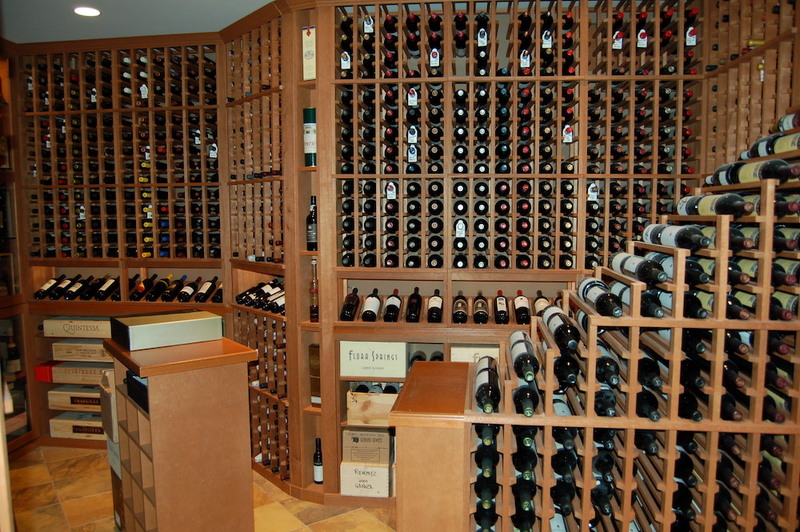 This wine cellar is from a new 25,000 square foot custom home in McLean VA. The racking was completely hand made from Honduran Mahogany, and the room incorporates granite counter tops, mirrors, and a tray ceiling. 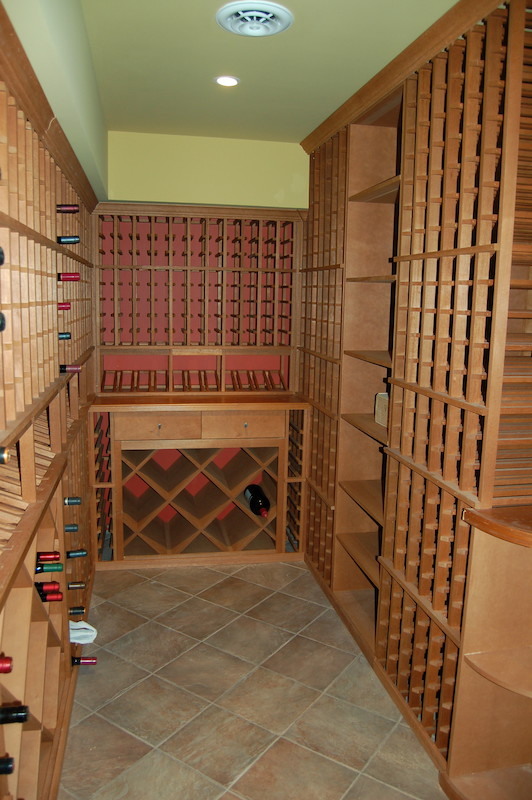 Also, incorporated in the racking is a fully functioning and climate controlled cigar humidor. The client for this project is a major collector of Australian wines, and also collects rare Whiskeys, Bourbons, and Scotches. The client's home is in Ashburn, VA. As can be seen by the floor plan, the footprint of the room is very interesting, and resulted from carving out as much space as possible from what used to be a large unfinished utility area. The footprint allowed the use of interesting display cabinets to transition corners. In the far corner is a lighted liquor cabinet for displaying the Whiskeys. The cellar holds about 2,100 bottles. Other notable features of this cellar include blocking the dead corners with material to match the racking providing a more finished look; lattice grate to cover the supply vent of the cooling system; and a moveable tasting table. 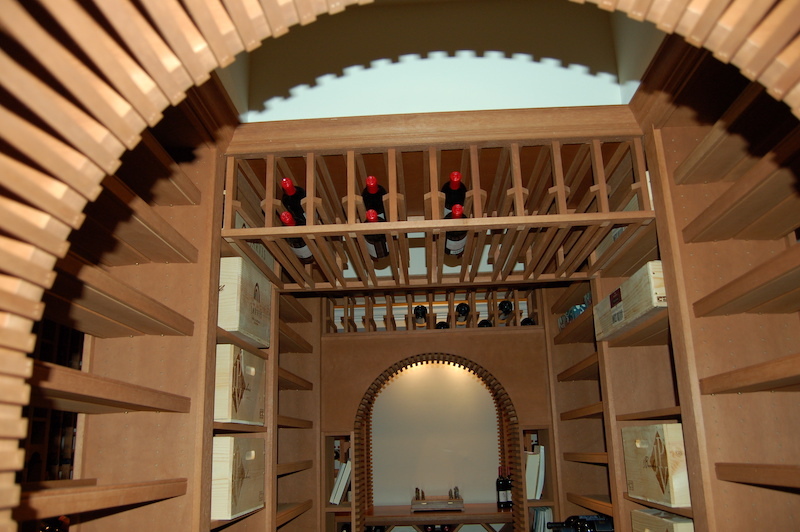 In this McLean VA project, the client was seeking a Tuscan style entertainment area, with a small footprint wine cellar adjacent to the dining area. We still managed to provide 1,000 bottles of storage in this small room. The floor and a tile relief in a picture opening provide a continuation the Tuscan atmosphere of the dining area. We partnered with a remodeler who was doing major renovations to this client's home, which is in McLean VA. 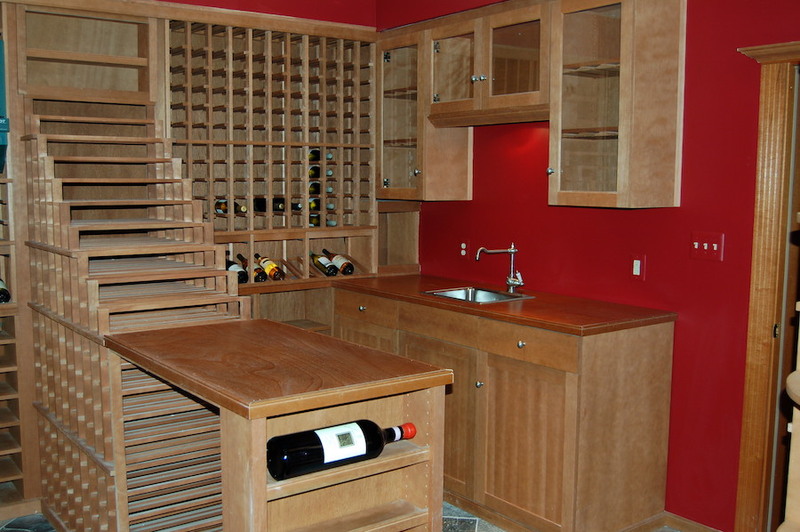 This is a really great wine cellar, which included a wet bar with cabinetry to match the racking. The center of the room was used to increase storage with a Waterfall display ending in a tasting table top. Lighted High Reveal Displays go around the entire perimeter of racking. The focal point of the room is the Archway, which can be seen through the entrance door. There is over 2,200 bottles of storage capacity. 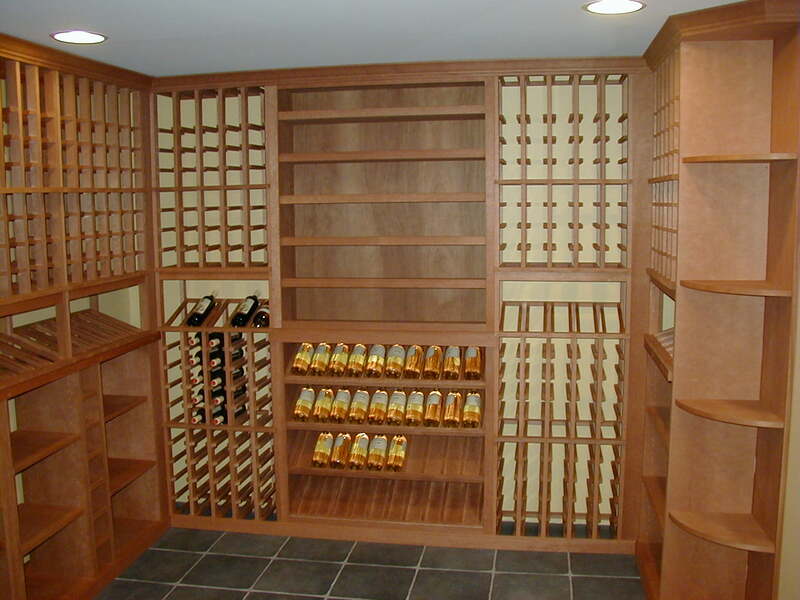 This client, a true Burgundy expert, is located in Oakton, VA. What was most interesting about this project was the unique footprint of the room. The design had to accommodate awkward curves and corners while maximizing storage capacity in a relatively small space. The finished room provided approximately 1,200 bottles of storage for individual Burgundy and Bordeaux bottles, along with bulk storage diamond bins and wood case bins. 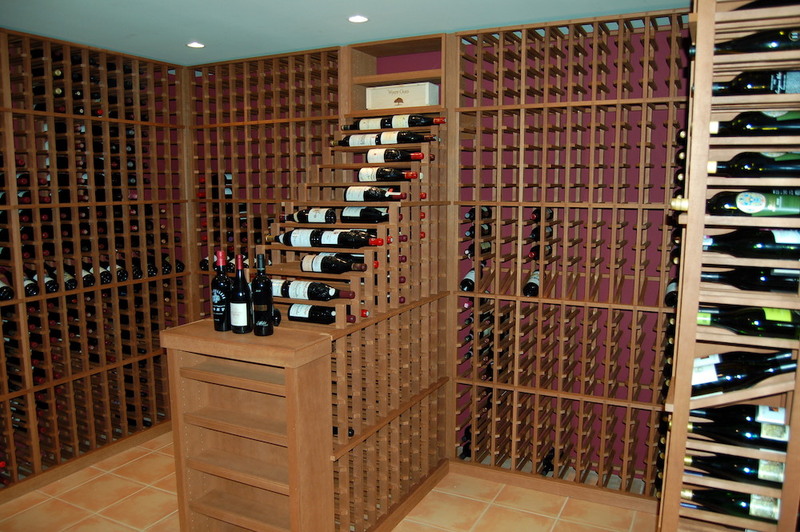 This client and his cellar was featured in NoVA Magazine, May 2006. This client has an awesome collection of California Cabs. We had a large footprint to work with, at 18 feet x 20 feet. A design challenge was to utilize a recess in the back wall that simply wasn't conducive for racking. So we built a closet there, and had a Mahogany louvered door made to house and hide the cooling system's evaporator. At almost 4300 bottles, there is plenty of storage capacity in the room, yet we didn't fully utilize the footprint because the client left room towards the room's entrance for a couple of tasting tables (not shown in the pictures). What makes this project interesting is how an area of the project, the sump pump, which was unusable for racking, was converted into a closet and blended in with the racking. We also incorporated a small waterfall to expand the storage capacity and to visually break up the room. This client is located in Potomac, MD. 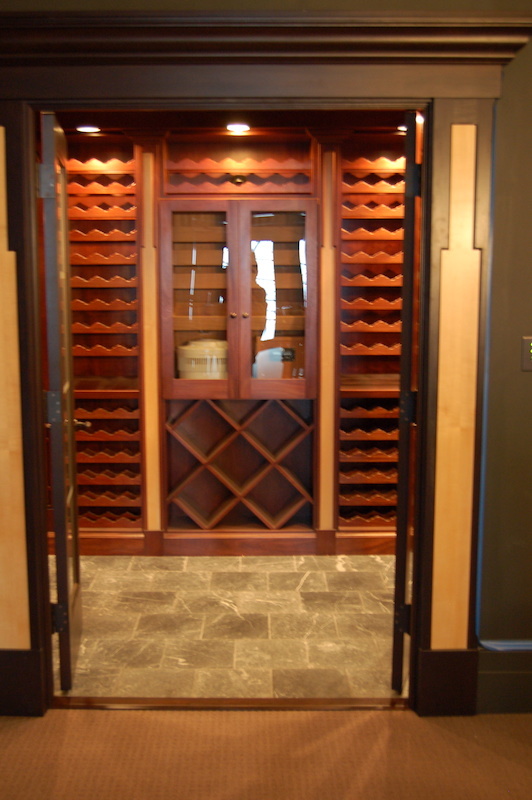 This wine cellar was built during the construction of a new custom home in Great Falls, VA. The room is relatively large at 24 feet x 18 feet, which enabled the incorporation of many storage style, and aesthetic accents. The cellar has two walk through Arches connecting the front of the room with the rear of the room. The storage capacity of the room is over 4100 bottles. This project is located in McLean, VA close to Langley. What is most interesting about this cellar is the liberal use of display racking, which serves to highlight a small, yet high quality collection. The room itself is open and airy, which matches the adjacent living areas. This is a terrific example of what can be done in a relatively small footprint. The client, who travels extensively and has an emphasis on Italian and French wines in his collection, shows what can be accomplished in even a small space. 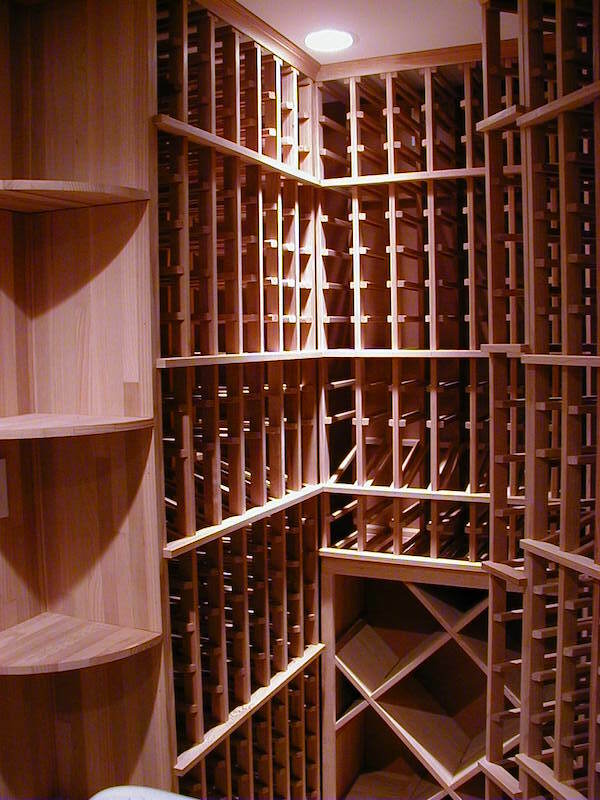 This room stores almost 900 bottles of wine, and there is no wasted space! These show 2 projects that are unique. 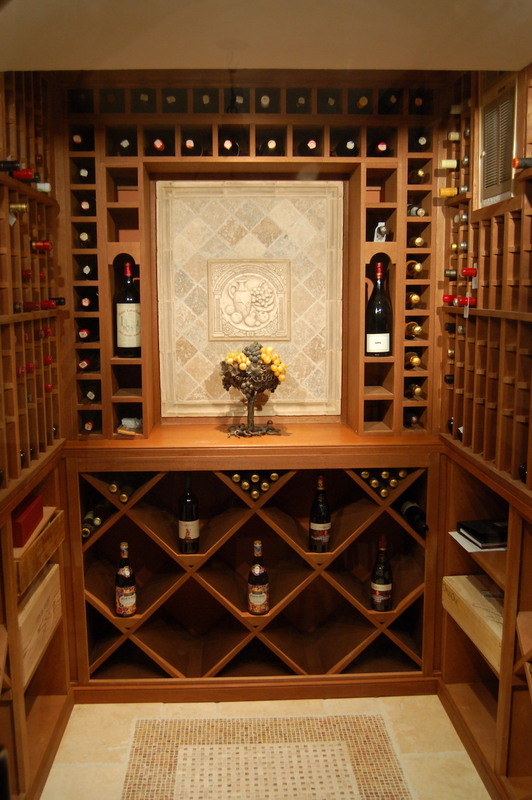 Neither is a wine 'cellar'. The first project, reflected in the floor plan, is actually a converted Butler's pantry adjacent to the dining room in this client's Clifton VA home. It really added a nice look to the ambiance of the dining area. 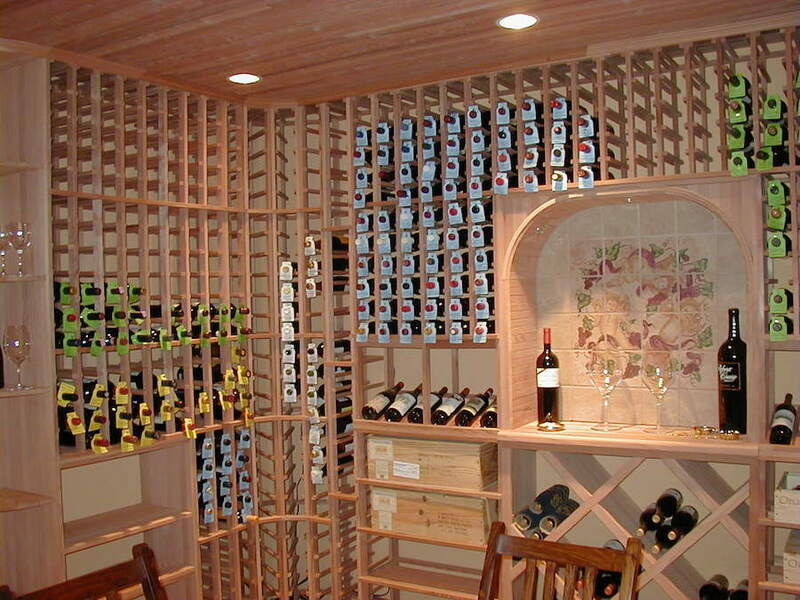 The other picture reflects a McLean VA wine pantry. The racking was created in the nook of an entertaining room in lieu of a liquor bar. This is a sentimental project. This was our first major project, and the client has become a good friend to the point that my wife and I participate in their wine tasting group. The client's home is in Frederick, MD, and their objective was to create a wine themed entertaining area. The room features a Tongue & Groove ceiling, with a full wall mural of a Tuscan vineyard. The Archway features a hand painted tile backsplash. The client decorated the room with several Oak barrels salvaged from a Virginia winery, and procured an antique harvest table with matching chairs, at which they serve wine tasting dinners at which they generously serve an awesome collection of California Cabernets along with other magnificent wines from around the world.